I’ve recently been working with a group of Digital Leaders in a school in Wolverhampton. 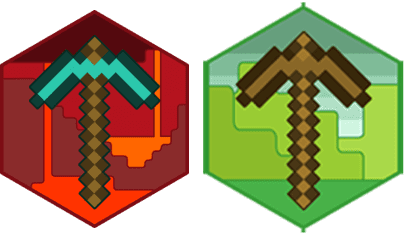 The school had a trial of Minecraft Education Edition and the Digital Leaders asked if they could run an after school Minecraft club – obviously, being a big fan of Minecraft myself, I said yes! Not long after launching our Minecraft club, the Digital Leaders were approached by a member of staff from the History department interested in using Minecraft in his lessons. After a brief consultation, the Digital Leaders offered to create a world for him based on Medieval Britain. They also offered to provide support during his lesson. 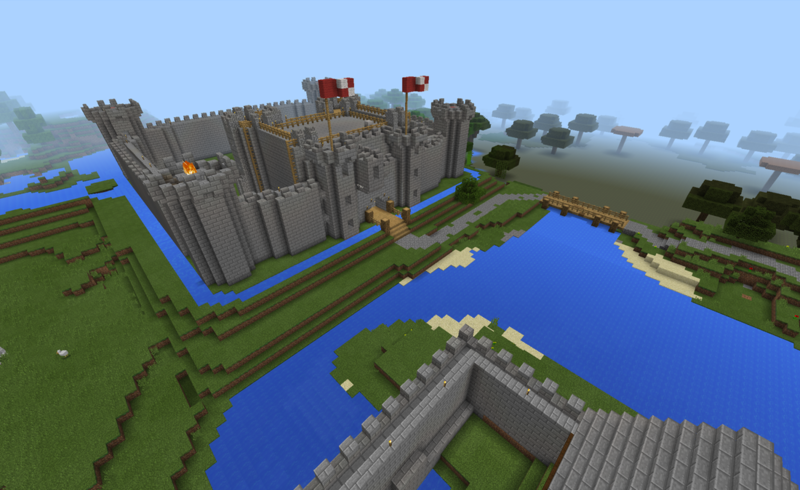 To begin with, the teacher supplied resources such as web links, books and images depicting Medieval life to help the student Digital Leaders with their build. Every few weeks the teacher would return to check on the progress of the build and suggest improvements – in essence the teacher became the client. As you can imagine, the lesson was a huge success, so much so that the students have received more requests for other worlds from teachers in Maths and English departments. 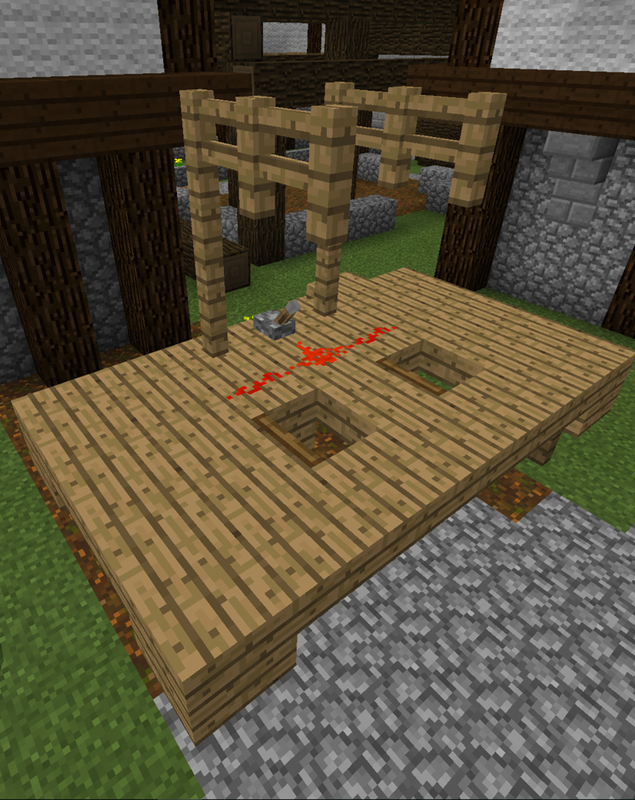 Here are some screenshots from the final build – notice some of the detail such as working hangman’s noose (using redstone) and animals in the peasants’ houses. 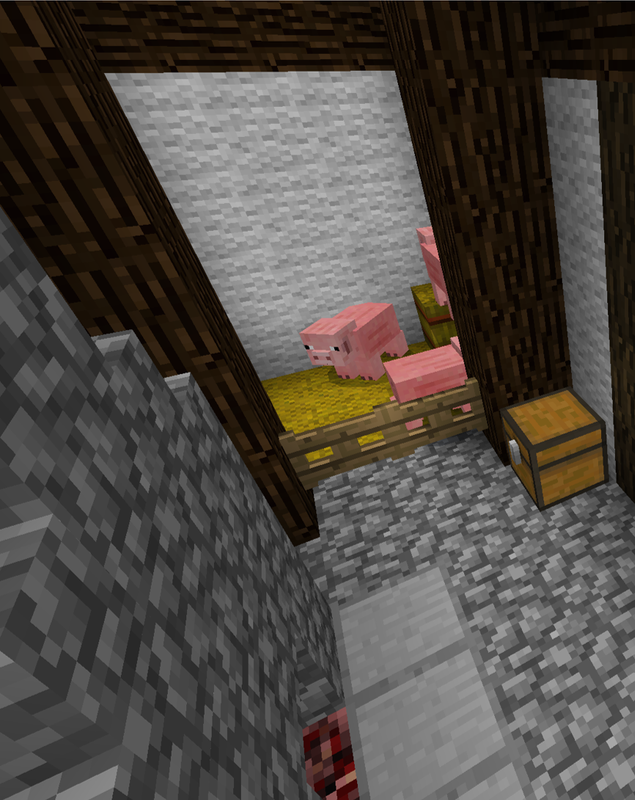 Part of a peasant's house was penned off for animals. Crimes such as theft were punished by hanging. 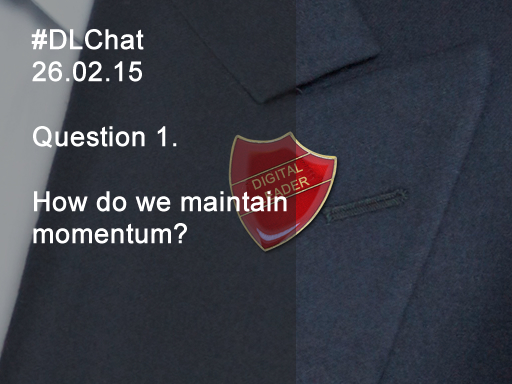 All this week (Mon 8th – Sat 13th Feb) I will be hosting #dlchat Twitter #slowchat. There will only be one question per day, ending on Saturday (Six questions in total). 1. 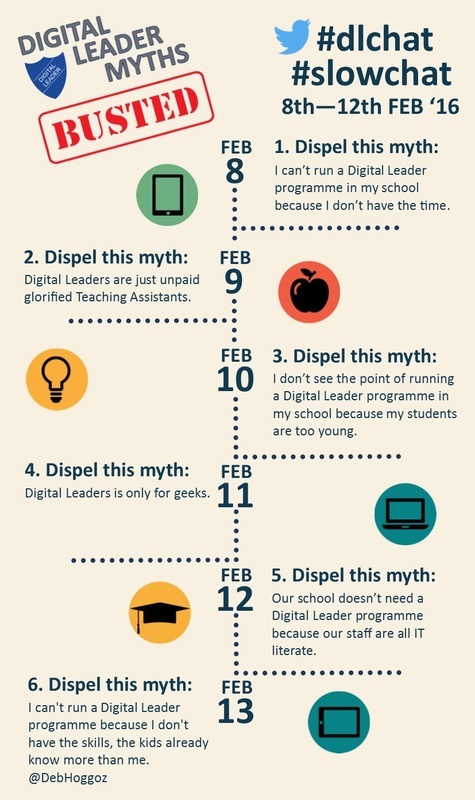 Dispel this myth: I can’t run a Digital Leader programme in my school because I don’t have the time. 2. Dispel this myth: Digital Leaders are just unpaid glorified Teaching Assistants. 3. Dispel this myth: I don’t see the point of running a Digital Leader programme in my school because my students are too young. 4. Dispel this myth: Digital Leaders is only for geeks. 5. Dispel this myth: I don’t need a Digital Leader programme because all our staff are IT literate. 6. Dispel this myth: I can't run a Digital Leader programme because I don't have the skills, the kids already know more than me. – Huge thanks to @DebHoggoz for suggesting this question. 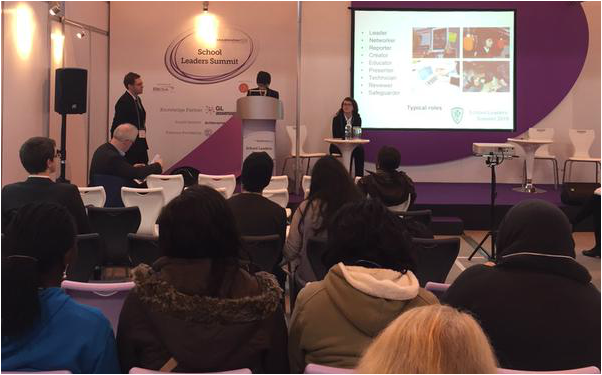 In January, three of our Digital Leaders were invited to lead a panel discussion at BETT 2015. The organisers of BETT were so impressed by our Digital Leaders that they invited them to present at the School Leaders’ Summit at the NEC, Birmingham. The School Leaders’ Summit, part of the Education Show, is a chance for School Leaders from schools across the country to learn, network and share educational best practice. A combination of case studies, panel debates and networking opportunities, the Summit covers a wide range of topics, which are obstacles facing school leaders today. Subjects include overcoming life with levels, using pupil premium effectively to raise student attainment, and using technology to enhance learning. The Digital Leader led session entitled ‘Case Study: Creating a student digital leadership team and handing power to the students’, explored how transferring authority to the students by creating student Digital Leaders has transformed the way in which technology is used across Highfields School. The session also explored how to create a successful Digital Leader programme as well examined how to maintain momentum and how to hand over ownership of the programme to the students. As always, the students were a credit to the school and had a wonderful, albeit exhausting, day. The students were also invited to take part in a ‘Meet the presenters’ session at the end of the day in which they explained what it means to be a Digital Leader. Build up suspense - Present the idea of Digital Leaders, put up posters – create a buzz to kick start campaign! Invite students to apply (Letter / Video – Be creative) Ask students to write an application or create short 1 min video on what makes them a Digital Leader. Draw up shortlist – Interview candidates (even better if student led). Interview process makes students feel they have earned role. Support staff and students with the use of technology. Test out new equipment and resources. Improve their understanding of technology. Share their knowledge and skills with others. On Friday 13th March, our Digital Leaders will be taking part in a national coding initiative in aid of Red Nose Day called Scratch Your Nose! What is Scratch Your Nose? According to the website: "Scratch Your Nose is a fun, exciting and educational event to create video games and raise funds for Comic Relief on Red Nose Day." The idea, which is the brain child of Andy Goff (Director for Education - Gazoob Ltd.), is that students create games in Scratch, either on the day or during the run up to Red Nose Day, and then charge their friends to play their games and compete to get the highest score. This is the second year we will have taken part in Scratch Your Nose Day. The first time was in 2013 when our Digital Leaders helped raise £500 by producing games in Scratch and charging their peers to play at lunchtime and during morning break. This year 360+ schools have already signed up - to register your school simply visit the website and click on 'Get Involved' to find out more. Don't know how to use Scratch? - not a problem! Scratch is free and easy to use plus there are lots of resources on the ScratchYourNose website to help you on the day. Don't want to use Scratch? - it's not compulsory to use Scratch to make your games - you can use any platform/tool you wish. This year we will be using Microsoft TouchDevelop to create our games. (Resources to follow soon). What are you going to code that's funny for money? Yesterday (Thu 26th Feb 2015), it was my pleasure to join the Queen of Digital Leaders herself, Sheli Blackburn (@SheliBB), as co-host of #DLChat! This wasn't my first experience of hosting an online chat session however, this was my first time hosting a #DLChat session - something I would like to repeat in the future! The topic for this #DLChat was "Maintaining Momemtum". During the session, I asked the questions: "How do we maintain momentum?" 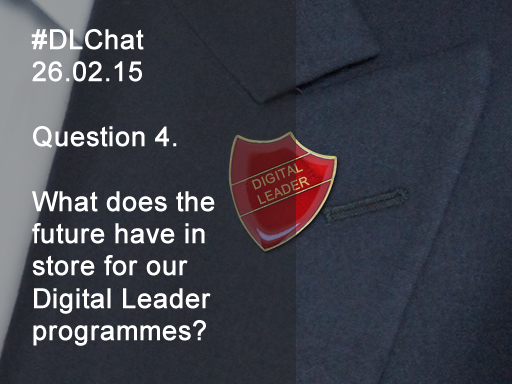 and "What has the future in store for the Digital Leader programme? ", I also explored how we can strategies for supporting transition of Digital Leaders between Primary and Secondary school as well as ideas for giving ownership of the Digital Leader programme to the students. Join us every Thursday at 9 pm on Twitter (21:00 GMT/UTC; 15:00 CST; Friday 08:00 ACT) using the hashtag #DLChat to debate and discuss anything to do with Digital Leaders! Yesterday, I took a group of our amazing Digital Leaders to BETT. It had been a few years since I last visit to BETT and my first visit to the ExCel arena. I can honestly say that I was pleasantly surprised at the new layout - one of previous criticisms of Olympia was that it was difficult to find anything due the multitude of floors and numerous halls. It was great seeing the advancements in technology and exploring how some of these can be used in a classroom setting. It was also great meeting up with other like minded professionals and hearing from some inspirational educational practitioners. However, my highlight of BETT this year had to be hearing the inspirational stories from our young student leaders - in particular the Digital Leaders. @clcsimon loved having the students in the #bettarena at #bett2015. Thank you for joining us @bett_show The Digital Leaders rock!!!!!!! I have also compiled a storiify so that you can read all the reaction as it happened! As part of our Digital Leaders programme, we are starting to explore the use of Open Badges to recognise / reward students' achievements. Open Badges is a new digital reward system which allows students to verify their skills, interests and achievements and store them all in one place. The badges are awarded by completing a series of tasks or meeting a set of criteria for which students must supply evidence. One model which we have started to use and demonstrates how Open Badges can successfully be used to recognise and reward student achievement is Makewaves. Makewaves (https://www.makewav.es/) is a safe social learning platform for 5-19 year olds (ideal for students and teachers). Makewaves fully integrates with Open Badges allowing teachers to make and award badges to their students. Students under the age of 13 can earn badges through Makewaves and convert them to Open Badges when they are old enough. Badges are currently available from a number of organisations including Computing At School, Rising Stars, Comic Relief and the National Literacy Trust. It gives me great pride to announce that 3 of our Digital Leaders have been invited to take part in a debate with leaders from industry / government on the topic of education technology at Bett 2015. Bett is the world's leading technology event that brings together innovation and inspiration to the education sector. The event attracts 35,000+ professionals within the industry and has been celebrated for over 30 years. The theme of Bett 2015 is inspired by and built around Thomas Jefferson’s quote “Let us in education dream of an aristocracy of achievement arising out of a democracy of opportunity”. Students’ Debate – What is it that we want from edtech? What do students actually want from edtech? What does edtech signify regarding enhancing personalised learning, support and feedback and lifelong learning? Student will also be live voting and reacting to audience pre-dispositions about what educators and industry think they want. 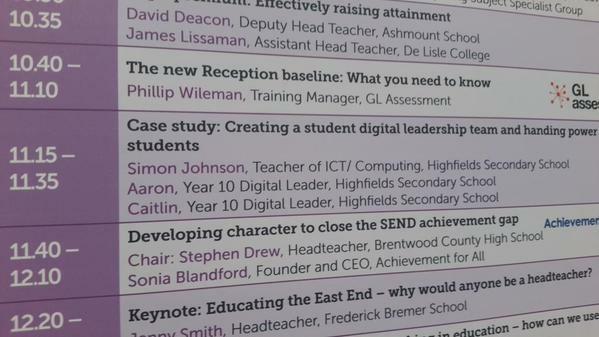 If you want to find out more about Digital Leaders or any of the topics covered in this blog, myself and a team of Digital Leaders from my school will be available to answer questions in the main Arena at Bett on Friday 23 rd Jan (11.15 - 12.00). Please feel free to come down and chat. 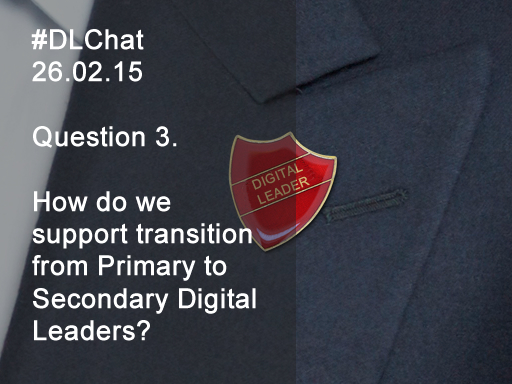 Myself and my team of Digital Leaders will be happy to answer any questions. 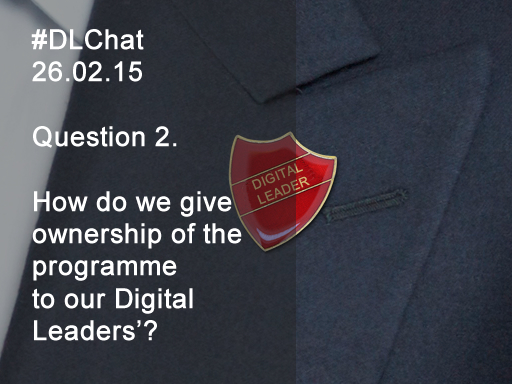 Alternatively, you can find out more by following the hashtag #dlchat on twitter every Thursday evening (9 pm GMT).